Home ishqbaaaz Ishqbaaaz 23rd March Episode Written Update Written Episode "Anika Steals Key From Shivaay Veer Threatens Anika"
Ishqbaaaz 23rd March Episode Written Update Written Episode "Anika Steals Key From Shivaay Veer Threatens Anika"
Shivaay,Omkara and Rudra hide Soumya under the bed and they hide behind the couch as Veer enters Soumya's room, Veer looks for Soumya, as he moves towards the couch, ShivOmRu get tensed. Veer takes Soumya's phone from the couch and thinks Soumya must have gone out and leaves. Veer comes to Roop and asks about Soumya. Anika is seen lost in thoughts as Gauri prepares the Kalgi for Rudra. Veer pulls Anika aside and questions about Soumya. Veer tells Anika that Soumya is missing and Shivaay must be knowing about his plan. Veer doubts Anika, Veer tells Anika to prove that Anika is helping him. veer warns Anika to find Soumya or else Shivaay will be killed by next morning. Veer shows his sharp shooter to Anika, she gets shocked. Anika gets worried as the shooter takes his position and points gun at Shivaay. Veer tells Anika that she has to swap Soumya with Bhavya or else Shivaay will be killed. Anika agrees to help Veer. 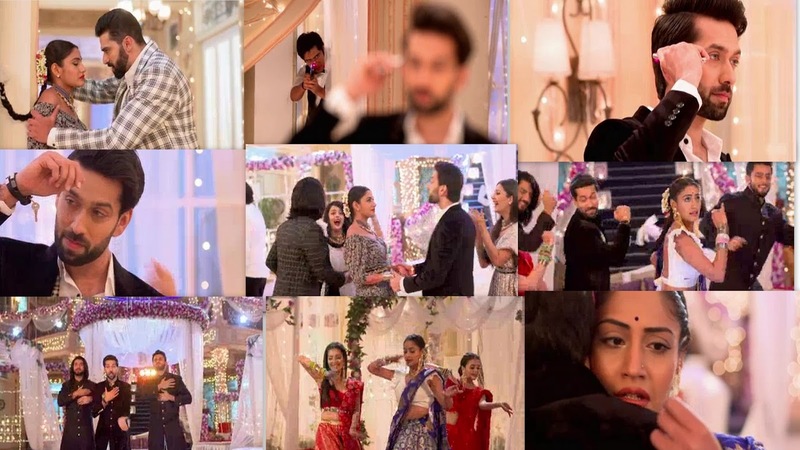 Oberoi family enjoys the functions, Anika tries to find out Soumya's whereabouts from Shivaay. He shows the key stuck to his wrist to her. Pinky and Jhanvi divide boys and girls, Khanna takes everyone's' phones as told by Pinky. Pinky stops Anika from talking to Shivaay . Anika gets worried. Roop thinks that she has to manage everything and has to keep Bhavya away from the wedding. Anika worriedly looks for Soumya and remembers the key and decides to get the key from Shivaay. Pinky tells Anika to put Mehendi. Shivaay and Omkara put Mehendi for Rudra. Shivaay and Omkara tease Rudra. Rudra runs away from them. Bhavya and Gauri write Rudra and Omkara's name in their Mehendi. Anika instructs the girl to write her message. Shivaay, Omkara and Rudra dance on Ye Raat Aur Ye Duri, Shivaay decides to get the key from Shivaay, Anika, Gauri and Bhavya join ShivOmRu. Veer keeps an eye on Anika. She manages to take the key from Shivaay without letting him realize. Anika feels guilty and silently apologizes to Shivaay.